1873 Chalon Issue, Perf. 12½, Unwmkd. William Fraser, Spink, June 2003, lot 293; with 1933 R.P.S.L. certificate. Scott No. 47. Campbell Paterson No. A1r. SG No. 137 £1,300 ($1,710). 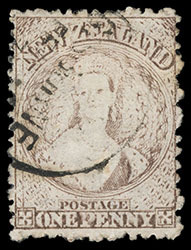 New Zealand, 1872, Queen Victoria "Chalon Head", 1d brown, perf 12½, Re-entry (R. 11/3), unwatermarked, exceptionally well centered with bright color on fresh paper, light strike of partial town cancel, Extremely Fine and choice. Scott No. 47. Campbell Paterson No. A1r (X). SG No. 137 var. £275 as normal ($360). 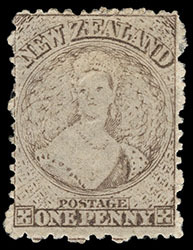 New Zealand, 1872, Queen Victoria "Chalon Head", 1d brown, perf 12½, unwatermarked, exceedingly well centered with tall margins, pretty bright shade, tied by "C" barred circle duplexed with "Dunedin, MY 27 73" duplex on wrapper to Port Chalmers, endorsed "Printed Papers Only"; professionally mended bottom corner and top center spot, a rare and Very Fine appearing printed matter use. Scott No. 47. Campbell Paterson No. A1r. SG No. 137 Estimate $750 - 1,000. References: Illustrated in Odenweller as fig. 14.2, p. 178. 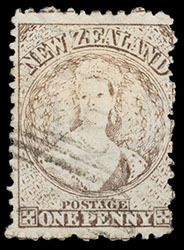 New Zealand, 1872, Queen Victoria "Chalon Head", 1d brown, perf 12½, watermarked (double lined capitals), clearly showing "A" of "TH SAUNDERS" watermark, lightly cancelled by partial barred oval, F.-V.F. and rare. Scott No. 47 var. Campbell Paterson No. A1r (Y). SG No. 137b £600 ($790). ONE OF ONLY FOUR RECORDED EXAMPLES OF THIS WATERMARK VARIETY. 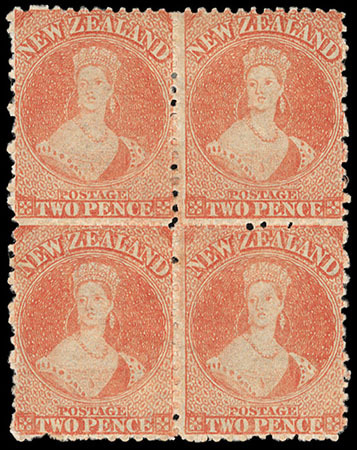 New Zealand, 1872, Queen Victoria "Chalon Head", 2d vermilion, perf 12½, unwatermarked, block of four (R. 9-10/3-4), o.g., hinge remnant, well centered with vibrant color, bottom pair with gum crease, fresh and Very Fine, Marcel Stanley, Christies Robson Lowe, December 1992, lot 408. Scott No. 48. Campbell Paterson No. A2t. SG No. 138 Estimate $200 - 300. 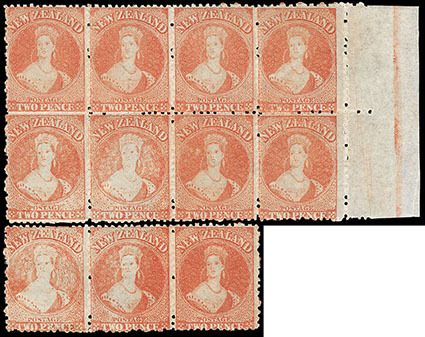 New Zealand, 1872, Queen Victoria "Chalon Head", 2d orange vermilion, perf 12½, unwatermarked, right margin block of eight (R. 15-16/9-12) and strip of three (R. 17/9-11) originally forming block of eleven, o.g., few hinge remnants, pos. R.16/9-10 and R.17/9-10 retouched, nicely centered with bright vibrant color, light gum crease affect strip and column 10, fresh and Very Fine large multiple. Scott No. 48. Campbell Paterson No. A2t (X). SG No. 138, 138a Estimate $1,000 - 1,500. Joseph Hackmey, Spink Shreves, February 2009, lot 1509. Scott No. 48. Campbell Paterson No. A2t (X). SG No. 138, 138a Estimate $2,000 - 3,000. AN IMPRESSIVE LARGE MINT ORIGINAL GUM BLOCK OF THE 1872 2D ORANGE VERMILION PER 12½ ISSUE SHOWING BOTTOM GUIDELINE. 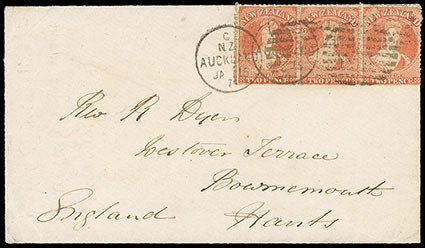 New Zealand, 1872, Queen Victoria "Chalon Head", 2d vermilion, perf 12½, unwatermarked, bright color, cancelled by "W" probably of Wakefield, and tied by numeral "0" barred oval on 1874 cover to Queenstown, "Kawarau, JA 8, 74" cds and Queenstown (1.9) arrival cds, flap with "J. Mitchinson, Wakefield Store" circular imprint, Very Fine and scarce manuscript cancel. Scott No. 48. Campbell Paterson No. A2t. This manuscript "W" cancel is previously unrecorded in volume III of the handbooks. 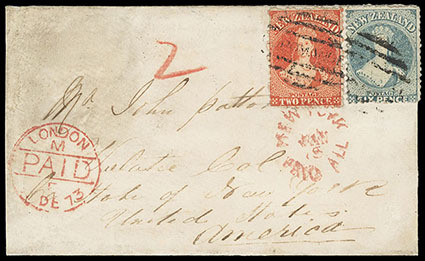 New Zealand, 1872, Queen Victoria "Chalon Head", 2d vermilion, perf 12½, unwatermarked, deep rich color, used with 6d pale blue (136), each tied by partial "COROMANDEL" barred oval, reverse with Kapanga, AU 27 '73" cds on cover to the United States, Auckland (4.29) transit backstamp and red crayon "2" pence credit to G.B., red London Paid transit cds and New York Paid All (1.5) arrival cds also ties 2d; cover restored and stained at upper left; reduced slightly at left, Fine. Scott No. 48. Campbell Paterson No. A2t. SG No. 138 Estimate $400 - 600. THE ONLY RECORDED USE OF THE "COROMANDEL" CANCELS ON A CHALON COVER. References: Illustrated in Odenweller as fig. 14.4, p. 178. 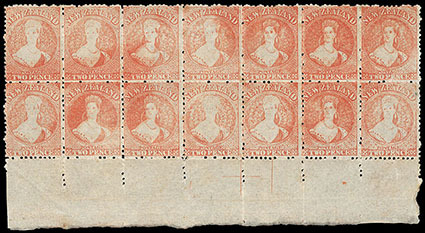 New Zealand, 1872, Queen Victoria "Chalon Head", 2d orange vermilion, perf 12½, unwatermarked, strip of 3 (R. 5/5-7), plate scratch on Queen's forehead (R. 5/5), tied by "Auckland, JA 15 '74" duplexed with barred oval cancels on cover to Bournemouth, England, reverse with Mar. 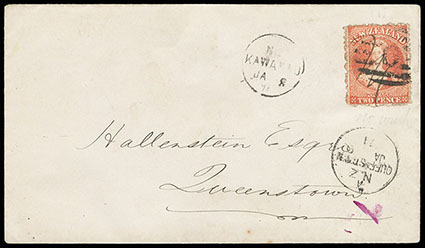 24th arrival cds; right 2d with trivial corner crease, Very Fine and scarce 2d franking for the 6d rate. Scott No. 48. Campbell Paterson No. A2t.